Do you know what a fluffernutter is? It is what those of us from New England call a peanut butter and marshmallow fluff sandwich! I came upon this recipe while looking for something to post for National Toasted Marshmallow Day! 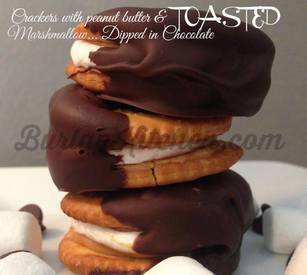 This recipe is called Crackers with PB & Toasted Marshmallows Dipped in Chocolate. So, what do I call them? Fluffernutter to the Max! Right? Ok, let's make some! Trust me, they're wicked good!